If you are finding the complete fundamental related to npn transistor then you are at right place. 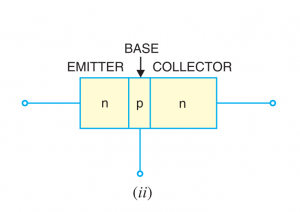 here we are going to cover this topics – NPN transistor definition, NPN transistor diagram, working, NPN transistor applications and how the transistor works as an amplifier? A device which formed by two n-type semiconductors separated by a p-type semiconductor. NPN transistor contains three semiconductors and two PN junctions between them. NPN transistor structure you can see below. Here P-type region has very thin layer respect to other two regions. The main part of the working of this transistor is the middle part or base part which is p-type. 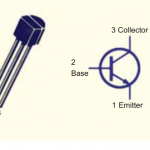 In this transistor emitter and collector is P-type semiconductors and a base is n-type of semiconductors. As you know p-type of semiconductors contains majority charge carrier as holes and n types of semiconductors contain majority charge carrier as an electron. On this basic knowledge, we can easily understand about the working of the transistor. That we see later on this post. 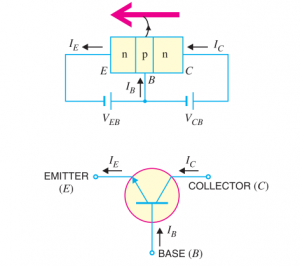 Before going to work let talk about the diagram of NPN transistor. here we discuss in details about the how to draw a diagram of this transistor. You see the diagram above. First, observe the diagram. This diagram is not that much complicated as you think. This diagram symbol only shows the direction of the current. here we give a two supply to the transistor. One is between emitter and base, second is between base and collector. Now you know emitter to base is always in forward bias and base-collector is always in reverse bias. So here current is flowing from base to emitter. That’s it. It is so simple you only have to draw the current direction in the symbol of the transistor. Hope you understand if don’t yet not worry read their working below you totally understand how this happens. Emitter-base junction is always in forward bias and base-collector junction is in reverse bias. Emitter-base junction is forward bias so that you have to connect n-type emitter to the negative battery terminal and p-type base to the positive battery terminal. Above figure shows a forward bias to an emitter-base junction and reverse bias to the base-collector junction. Here n-type semiconductors contain electrons as a majority charge carrier so that because of the forward bias electrons start to flow towards the base region. This current is called an emitter current. As the electrons flow through p-type they tend to combine with holes. As the base is a very thin layer and light doped only a few electrons combine with holes. This constitutes base current( Ib). This base current is in microampere. The remainder current passes to the collector region. This constitute collector current ( ic ).so this two current is the total emitter current. 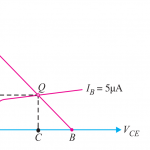 Emitter current is the total of base current and collector current. The most of electron from emitter continue their journey through the base to collector. Only a few electrons combine with the holes. The base is very highly doped and very thin layer so electron gets enough time for the combine with holes. So hope you understand the working of the transistor and now you know how NPN transistor is work? If still you have any doubt then comment here we help you related your questions. NPN transistor is widely used in switching devices. Most of the switching devices are now uses NPN transistors. NPN transistor is often used as an amplifier. Used in the some Darlington pair circuits. NPN transistor often used in very high-frequency applications. here we talk about how transistor works as an amplifier? A transistor raises the strength of the weak signal thus it can use as an amplifier. Here figure shows the basic circuits of the transistor amplifier. Here weak signal we have to apply at the emitter-base junction of the transistor. We get output at the collector-base junction as a figure. 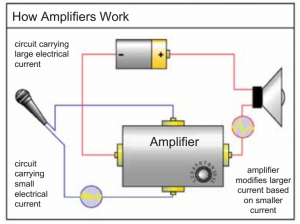 For proper faithful amplification of the signal, we have to make the proper circuit. DC voltage Vee is also applied with input signal between emitter-base junction. This external d.c voltage is called bias voltage. Input circuit has small resistance so that causes the change in emitter current because of transistor action collector is also almost same as emitter current. 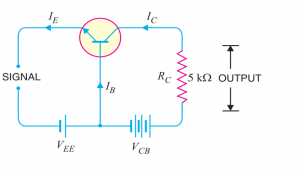 This collector current (Ic) passes through the high resistive load at the collector circuits. The high load resistance Rc produce a high voltage across it. Thus, the weak signal amplified at the collector circuit. In this basic way transistor work as an amplifier. Here you can easily understand how transistor really works as an amplifier by example. Let assume collector load resistance is 5 kΩ. Assume 0.1 V change in input signal voltage produces 1 mA current. Obviously, this emitter current is the same as the collector current. Thus the change of 0.1 V in input signal change 5 V into an output voltage. By this way, the transistor is able to amplify the signal. hope you find all fundamental related to npn transistor. 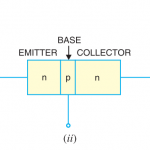 here we discussed about the definition of NPN transistor and diagram of npn transistor. We saw working and construction of npn transistor. In last we saw some of the applications of npn transistor. If you have any question regarding this article kindly comment below.